As we have seen in posts to this blog throughout the summer months, the Fourteenth Connecticut Volunteer Infantry always seemed to on the move during the three months since the start of the siege of Petersburg in June 1864. We tend to think of the Petersburg campaign as limited to The Crater and the other sites we can visit just outside of the city, but the siege lines stretched across about thirty-five miles of southeastern Virginia and it’s to lose track of our little regiment. The following series of maps are portions of one large map of the siege lines from the Library of Congress Digital Map Collection, upon which I have drawn the movements of the regiment from June to September 1864. Union lines are shown in red and the Confederate lines in blue. 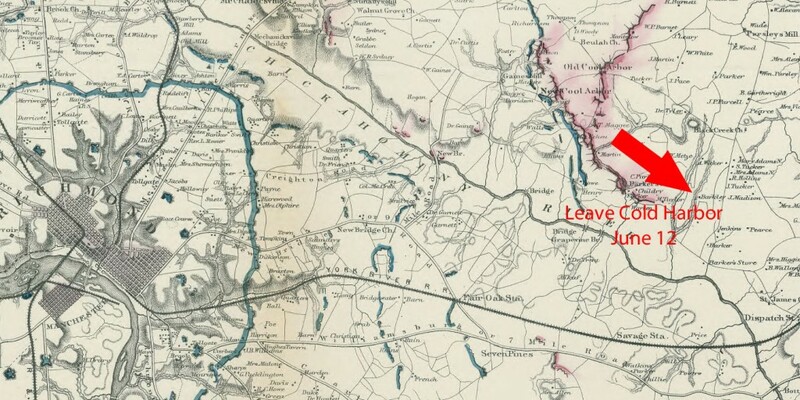 Here’s the link if you wish to open the original map in a separate window http://www.loc.gov/resource/glva01.lva00182/. 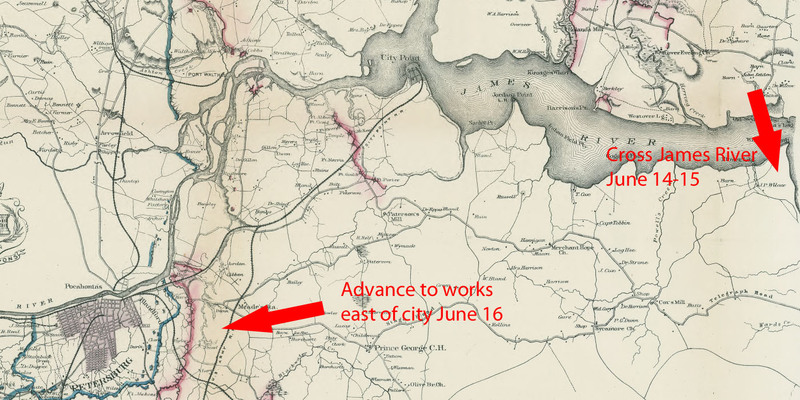 Compare the 1865 map to a modern day map or Google Earth and you will see just how far the siege lines stretched. The northeastern end of the Confederate lines was close to Richmond International Airport while the southwestern end was south of the Petersburg airport. This entry was posted in 1864 - Summer, General Information, Siege of Petersburg on September 19, 2014 by admin. During the middle and latter weeks of September 1864, the Fourteenth Connecticut Volunteer Infantry was not engaged in any fighting. Their duties included the usual manning of the picket line every four or five days and working at building and improving the fortifications at several points along the Union siege line. Some of the fortifications the soldiers built during the siege can still be seen today. Fort Davis was built on the western side of the Jerusalem Plank Road and you can see what remains today on Google Earth. The Jerusalem Plank Road is now called Crater Road and the remains of Fort Davis can be found at the intersection of South Crater Road and Flank Road, right across the street from Fort Davis Shopping Center. Fort Davis was originally named Fort Warren after the commander of the Fifth Corps, Maj. Gen. Gouverneur K Warren. However, it was renamed in honor of Col. P. Stearns Davis of the 39th Massachusetts Infantry, who was mortally wounded there by an artillery shell fragment on July 11. From the Historical Marker Database website (www.HMdb.org) we have this description of the fort. “One of the Union soldiers assigned to this task recalled: ‘Covering about three acres of ground, it is capable of holding a brigade…. In building our fort, we dug a trench twenty feet wide and ten feet deep, and threw up the rampart on the inside. The fort was made square with a diagonal through it. We had a magazine in it, and two wells were dug for a water supply…it took eight men to get one shovelful of dirt from the bottom of the ditch to the top of the work, the men standing in little nitches cut in the side of the bank and passing the earth from one to another.’ The completed fort held a garrison of 550 men with eight field guns.” To watch a short YouTube video of the Fort Davis site, please click here. Next week: A digital tour of the siege lines. This entry was posted in 1864 - Summer, Men of the 14th, Siege of Petersburg on September 12, 2014 by admin. In the aftermath of the defeat at Reams Station of the Second Corps, which was widely regarded as the Union Army of the Potomac’s finest corps, Gen. Winfield S. Hancock was humiliated. “Hancock the Superb,” so dubbed by Gen. George B. McClellan, was proved mortal after all. Gen. John Gibbon, commander of the Second Division of the Second Corps, to which the Fourteenth Connecticut Volunteer Infantry was attached, was so upset with Hancock for not sending for reinforcements sooner, that he almost resigned his commission. The Confederate infantry and cavalry units that had gone into battle that 25th of August returned to the Petersburg defenses elated. They had tasted sweet victory once again. They believed even more fervently in the rightness of his cause and in final victory, and they were confident that they could assault and take any position from the Yankees, fortified or not. Within the ranks of the Fourteenth Connecticut, fewer men answered the call of the roll. The death of Captain William Hawley (Company K) grieved every member of the once again small regiment. Since the previous October, when there had been about 660 men present for duty, their numbers had been reduced through combat and disease, so that there were but 167 men in the fight at Reams Station. Fifty-one of these men were lost as casualties (killed-5, wounded-18, missing-28). This loss was comparable to Gettysburg the year before. The Fourteenth went into that battle with about 160 men, 66 of whom were listed as casualties (killed-10, wounded-52, missing-4). Curiously, the men were not despondent. In fact, there was a growing understanding within the ranks that they were now engaged in the final stages of the war, the beginning of the end, we might say. The Union perimeter around Petersburg had been extended westward and encompassed the Weldon Railroad. Confederate supply trains could come only as far north as Stony Creek. Wagon trains had to carry the supplies the remainder of the way to Petersburg, a distance of thirty miles, much of it along the Boydton Plank Road. A few days later the men would learn that Atlanta had fallen to Union forces. The same slow, encircling, strangling strategy Sherman had used was being employed at Petersburg. 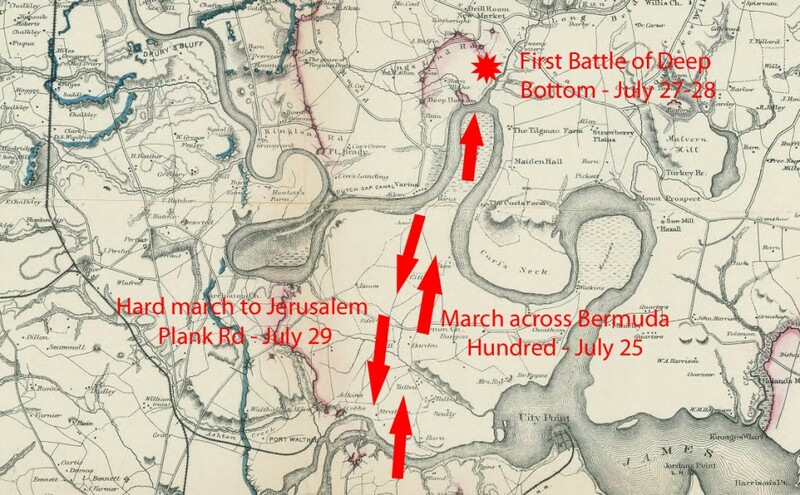 Over the coming weeks Federal fortifications would be extended even farther to the west and the Boydton Plank Road would become the next target for the Army of the Potomac, and for the men of the Fourteenth Connecticut. This entry was posted in 1864 - Summer, Battles of the 14th, Siege of Petersburg on September 5, 2014 by admin. Darkness ended the fight at Ream’s. Confederate Generals A. P. Hill and Henry Heth had managed the battle brilliantly. Nightfall ended the fighting. Federal reinforcements were rushing forward. With no reinforcements of his own to be had, Hill disengaged his troops, withdrew northward to the defensive perimeter around Petersburg, and the Weldon Railroad remained under Federal control. In the afternoon of August 25th, 1864, during a charge upon the Confederate batteries on the battlefield of Ream’s Station, our advancing line suddenly broke and retreated. Overwhelmed by the terrific fire that was raining down upon us, and being slightly in advance of our main line, I suddenly realized that our forces were on the retreat. I was left almost alone, and it seemed to me as though the whole fire of the enemy was directed at me. Realizing at that moment the wisdom of the old adage that “discretion is the better part of valor,” I immediately hunted for cover, which I found in a deserted rifle-pit a short distance to the rear. Here I found a comparatively safe, but unpleasant shelter, where I was compelled to lie flat until the shadows of night concealed me from the view of the enemy. When peering forth I could see the flickering lights of many lanterns, and I knew that the human vultures were at their unholy work of robbing the dead and wounded. I crept from my place of concealment and began making my way cautiously over the field without knowing which way to go, when suddenly I heard a call from a comrade who had fallen wounded in two places. I stopped and made him as comfortable as possible with the means at hand, cutting cornstalks to make him a bed. Since he was suffering terribly from thirst, I started out in search of a spring that I knew to be somewhere in that vicinity. Rounding a hill or knoll where I supposed the spring to be I found myself in the midst of quite a force of the rebs and a prisoner of war. Not forgetting my own terrible thirst, I managed to work my way through to the spring and was filling my canteen when I felt a hand upon my back. Turning with the expectation of seeing a rebel guard, I was delighted to find not only a Union soldier, but a member of my own company. Comrade Pardee and I determined to attempt to escape under cover of the darkness. Guessing as nearly as possible the direction necessary to seek for our forces, we worked our way cautiously over the battlefield until we came to the breastworks we had assisted in throwing up that day. A voice called for assistance. Stopping to investigate, we found it came from Captain Nickels, Company D, who lay wounded, shot through the leg and unable to move. To add to his misery the rebel cavalry had been there and robbed him of hat, coat, watch, money and other valuables, and only desisted from taking his boots because, in trying to remove them from his wounded limb, they caused him such intolerable suffering as to touch the heart of even a rebel cavalryman. As if to add still more to the poor Captain’s suffering, the rain began to pour down in torrents, and not being able to carry him, we made him as comfortable as possible with our rubber blankets to protect him somewhat from the inclemency of the weather. We started out, hoping to get assistance that we might return and bring the Captain within our lines where he could be cared for. We had proceeded perhaps two miles in the direction he had pointed out to us when we met Adjutant Hincks and another comrade. They had heard Captain Nickels was left on the field and were coming back in search of him. With them we retraced our steps and brought the wounded man to where our ambulance train was stationed. Adjutant Hincks left me to take charge of the captain until we should reach such a place as he could be attended to by the surgeons. But the end of that night’s hardships was over, for after the ambulance had started, it went over stumps and stones and uneven ground, making such a thumping and jostling, that Captain Nickels was unable to endure the pain it caused. I was compelled to procure a stretcher and, with such help as I could procure from stragglers, I tramped along through that whole night. Sometimes I would be without help and would be compelled to wait. I accosted weary stragglers as they passed, imploring them to give the Captain a little assistance towards safety and the treatment he so much needed. Fourteen weary miles we tramped carrying the wounded man that night, through woods and swamps and over rocks until, just as day dawned upon us, we reached the hospital tent, more dead than alive, and left the brave man to the tender mercies of the surgeons. This entry was posted in 1864 - Summer, Battles of the 14th, Men of the 14th, Siege of Petersburg on August 28, 2014 by admin. “I immediately hunted for cover, which I was so fortunate to find in a deserted rifle-pit a short distance to the rear.” Sgt. Henry Lydall, Company F, Fourteenth Connecticut Vol. Inf., regarding the fight at Ream’s Station, August 25, 1864. The Weldon Railroad was the only railroad link from Petersburg to the only open Confederate port on the eastern seaboard—Wilmington, NC. In the Battle of Globe Tavern (Aug. 18-21), Lee’s troops, under Lt. Gen. A. P. Hill, tried again and again to drive the Union Fifth Corps, from the railroad near Globe Tavern. Hill’s attacks only forced Maj. Gen. G. K. Warren to draw his lines back a short distance along the railroad, but the Federals never gave up possession of the vital link. In the end, Hill was forced to admit defeat and withdraw north toward Petersburg. 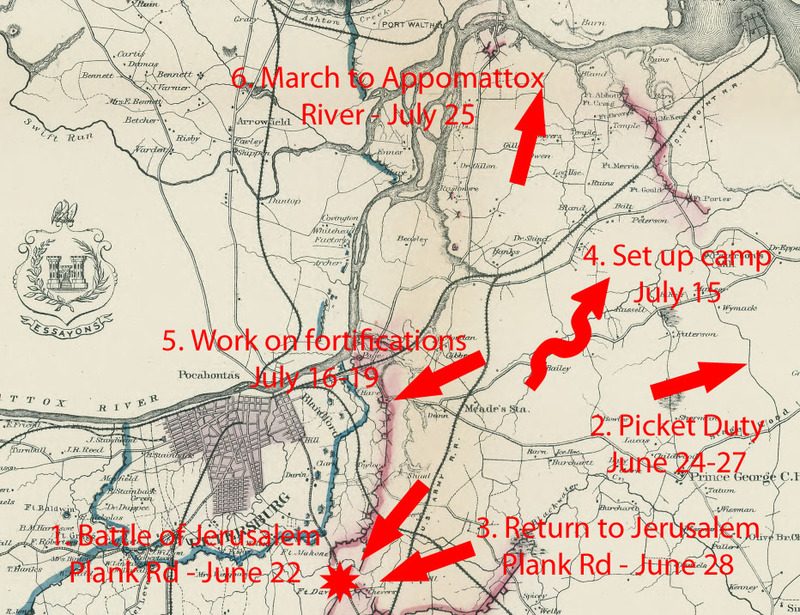 The Union Second Corps, under Maj. Gen. W. S. Hancock had left the north side of the James River August 18th and had marched all the way around the Petersburg siege lines to the western end on the Union entrenchments at Globe Tavern. It was a distance of about thirty-five miles, but the roads were muddy from summer storms. The going was hard and no period for extended rest was given. The men were exhausted when they finally arrived in support of the Fifth Corps. 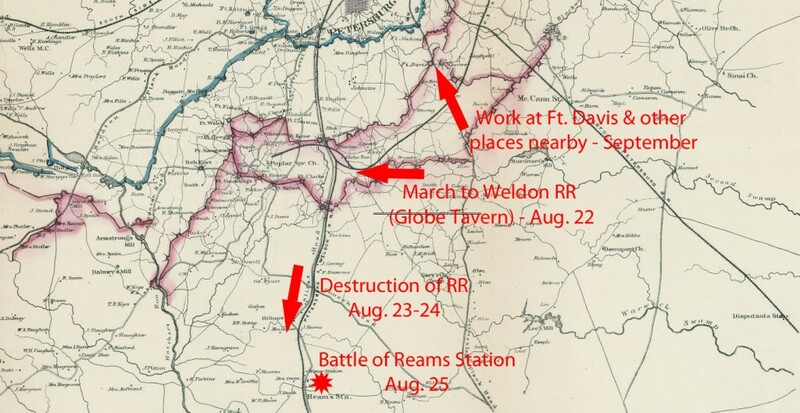 The Fifth Corps remained at Globe Tavern working to extend the Union trenches to secure the railroad while the Second Corps, now only two divisions strong (about 9,000 men), moved slowly south down the railroad. With Miles Division on the lead they tore up the rails and heated them to glowing red over piles of flaming ties so that the rails were unusable. But the movements of the Second Corps had not gone unnoticed. Understrength and detached from the rest of the army as they were, the two divisions of Hancock’s Corps (1st – Miles and 2nd – Gibbon) made a tempting target. Despite their weariness the men of the Fourteenth Connecticut spirits were high the evening of the 24th. They had reached a small depot called Ream’s Station and they had helped to destroy the railroad for a distance of about six miles. And, for the first time since their first battle at Antietam almost two years ago, all ten of the company captains were present and fit for duty. At about 11:30 that night, Gen. Hancock received a message from Gen. Meade’s headquarters informing him that a large force of enemy infantry was marching in his direction. Hancock arranged his defensive position in the shape of a pointed horseshoe, with the open end toward the east. The north and south sides of the horseshoe were only about two hundred yards apart, with Miles’ Division protecting the north and Gibbon’s Division the south. Hancock positioned most of his artillery at the closed western end along the railroad. The first Confederate assault came shortly after noon on August 25th, from the northeast against the western end of Hancock’s horseshoe. Federal artillery quickly stopped the attack and drove the Rebels back to the cover of the woods. A few hours later the Confederates rushed forward again, this time from the southwest, and again heavy fire from their front and sides forced them to fall back. At about 5:30, a third assault was launched, this time led personally by Gen. Henry Heth. At first, it appeared that it would end as the previous two assaults had, but just as it seemed to Gen. Miles the day would be won, one of his brigades on the northwest portion of the horseshoe panicked and started a stampede for the rear. The words of Sgt. Charles Blatchley (Co. I, 14th CT) describe the utter confusion that followed: When at last the railroad line gave way, we were called from our line to this side to repel the charge, and facing about we countercharged over the little “V” shaped battle ground to meet the oncoming foe. In the tempest of conflict that followed, organizations almost disappeared. When near night the attempt was made to reform a part of the line and fill up a gap in what had been our original line, General Smyth (the brigade commander) called for the One Hundred and Eighth New York and the colonel responded, “I am here, General, but I have no regiment.” To the call for the Fourteenth Connecticut, perhaps ten of us answered “here.” In obedience to the order, with perhaps a score of others, we dashed into the gap, to be swept as quickly out of it by the enfilading fire which the enemy at that moment poured in from the toe of the horseshoe. Amid the blinding flashes of a terrible thunderstorm in one of the darkest nights I think I ever saw, both sides retreated and we lost, besides a great number of men, all our artillery but one single gun that a little party, of which I was one, pulled out by hand in that driving storm. These were the first cannon that the Second Corps ever lost and it is said that General Hancock sat at the root of a tree beside the road that night, the picture of distress over the disaster. This entry was posted in 1864 - Summer, Battles of the 14th, Siege of Petersburg on August 22, 2014 by admin. After Confederate Lt. Gen. Jubal Early’s serious threat to Washington in July, Gen. U. S. Grant dispatched Maj. Gen. Phil Sheridan to organize Union forces in northern Virginia and West Virginia into a fighting force that would not only keep Early at bay, but also seize and control the entire Shenandoah Valley. About August 10th, Gen. Lee allowed word to leak out that he had sent an entire infantry corps northward to reinforce Early. Lee hoped that Grant would send more troops to reinforce Sheridan, thus moving the bulk of the fighting north and lifting the siege of Petersburg. In reality, Lee sent only one division, but Gen. Grant believed the false report, and instead of reacting the way Lee hoped he would, Grant employed the same strategy he had used at the end of July—threaten Richmond directly. On August 9th, Col. Theodore Ellis reported the strength of the Fourteenth Connecticut Volunteer Infantry as 14 officers and 160 enlisted men. A few days later, Ellis was away from the regiment, and his second in command, Lt. Col. Samuel Moore, not only commanded the regiment, but was also in temporary command of the Third Brigade (Smyth), Second Division (Gibbon), of the Second Corps (Hancock). 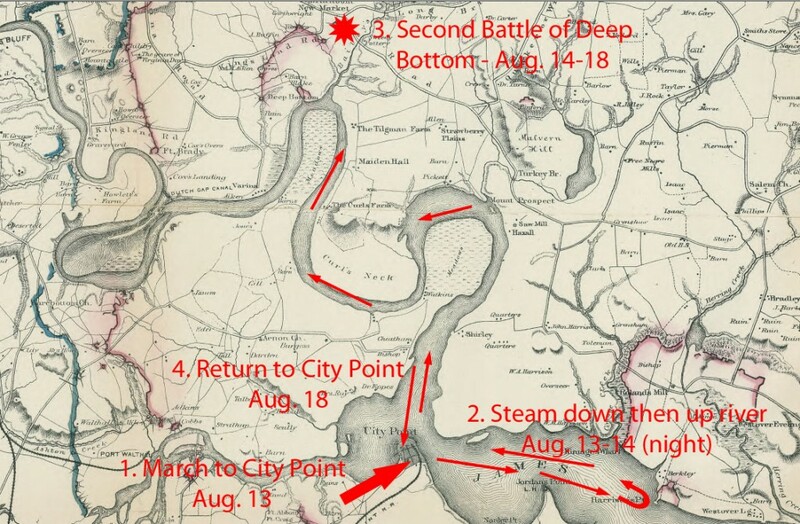 On Saturday, August 13th, under orders directly from Gen. Hancock, Moore marched the brigade to the wharves at City Point where they boarded five steamboats. That evening the steamers cast off and turned downriver toward Newport News. Speculation was rampant as the men tried to guess where they were headed—Washington, Baltimore, or other points along the east coast were spoken of with wild expectation. But not even Lt. Col. Moore knew their destination. At midnight, Moore took an envelope from his pocket and opened it. It held orders, sealed by Gen. Hancock himself. Moore went immediately to find the captain of the vessel. He told the captain to reverse course and put in at Deep Bottom. The following day the regiment was ordered to relieve a skirmish line of the Third Division. Their route lay over open ground in plain sight of the enemy, and to advance in any type of regular formation would have been suicidal. Moore divided the regiment into small squads of six to eight men each. He then sent one squad at a time running zigzag across the field to the advanced position, which they held for the remainder of the day. The Fourteenth was also called upon for a special assignment. Federal gunboats, including the USS Agawam, which carried two one-hundred pound Parrot rifled cannon, were shelling the Confederate fortifications along New Market Heights. Confederate guns fired back and at times made it quite uncomfortable for the Union sailors. A detail of the Fourteenth, probably including the men of Company D, who carried the Sharps rifles with the Berdan alterations, was sent forward to maintain fire on one of the Rebel guns. The men did their job so well that the gun did not fire from 9:30 in the morning for the remainder of the day (probably the 16th or 17th). Years after the war a Confederate officer who had been in the fort that day met a member of the Fourteenth Connecticut. The fire of the Fourteenth’s sharpshooters had been so accurate that it prevented all efforts to load and fire the weapon. Although the Second Battle of Deep Bottom lasted until August 20th, the Fourteenth returned to Petersburg on the 18th. They had lost one man killed, a second mortally wounded, and six others wounded. Although the fighting yielded no victory for Grant, it did force Lee to once again rob the defenses around Petersburg to stop the Union threat to Richmond north of the James, and this reduced the force that Lee was able to muster against Gen. Warren’s Fifth Corps along the Weldon Railroad southwest of Petersburg. This entry was posted in 1864 - Summer, Battles of the 14th, Siege of Petersburg on August 15, 2014 by admin.